Set in London in 1818, it’s the story of Rose Collingwood, daughter of a baron, who wanted to play Portia in The Merchant of Venice. To accept the part at the Theatre-Royal at Haymarket, the very proper young lady assumes the disguise of Miss Lily Underwood, the actress. Who knew all of London would soon be at her feet sending her love notes? One such Valentine goes awry only to be found by the dashing Irish barrister, Morgan O’Connell. Though he would have seduced the actress, Morgan must court the lady. Given three choices much like Portia’s suitors, can she resist the handsome Irish rogue? And who is it who is following her? This is another cleverly written story from the talented Ms Walker, Set in London 1818, Lady Rose Collingwood, daughter of the famous Admiral Collingwood – who was a real figure in history – she wants excitement, she wants to do what she has always wanted to do, which is be on the stage in the theatre. Under the alias of Lily Underwood, Rose has got her wish to play the part of Portia in ‘The Merchant of Venice’. At night she is in her element, wooing the crowds with her skilful performance and during the day she is the sweet, obedient Baron’s daughter. Rose has the best of both worlds, as long as know one from either side of her life knows the truth. She is happy with her double life, she has no intention what so ever of doing the dutiful society lady thing of marrying and producing heirs. No, she wants to be free, to do as she pleases and that is what being an actress gives her. It is while she is doing a particulay enthralling performance as Portia that she catches the eye of charming barrister in training; Morgan O’Connell, cousin to the famous Danial O’Connell. He is enchanted by her, he wants to know the real ‘Portia’ so when by chances comes across a secret valentine addressed to Lily Underwood, he can’t believe his luck especially when it leads him to the front door of the Dowager Countess of Claremont, who just by chance is in the mood for a bit of match making. She divulges a secret to him and gives him the perfect opportunity to meet and get to know the real woman who has captured his attention. I do love intermingling character’s that jump from one book to another, even when those books aren’t related, and Ms Walker has a real flare with having her characters intermingle and interact throughout her books. The best book jumping character I have ever encounted has to be the brilliant, Dowager Countess of Claremont. She is a hoot; such a wonderful character and I am so pleased that again this feisty lady has made an appearance. I particularly like how different Morgan and Rose are, they are two individuals that you wouldn’t have initially put together, and yet they really work. Barrister in training; Morgan is dazzlingly charming, being an Irishman in London at a time of great political upheaval cannot have been easy, yet he proves himself and shows just what a smart genuine man he is. I really like how he can laugh at himself, he can take a joke. He is supremely confident, but not in an arrogant way and he is able to converse with all people and really stand his ground with topics that he is passionate about – and he is a very passionate man. Swoon worthy, would be accurate! As Morgan and Rose’s budding romance begins to bloom, they are caught in a compromising position after an incident while out on a carriage ride. Add to that an attempted kidnapping, a zealous fan lurking in the shadows and a moment alone in an empty house and you get a thrilling and beautiful romance. “That was not proper.” It was all she could think to say, though she experienced a pang of guilt at not discouraging his kiss before it took place. As ever with Walkers work you are educated as well as entertained. As well as the sweet and loving romance between Rose and Morgan, there are snippets of what was happening in Ireland with the Protestant/Catholic and Political conflict. Walker has written the unrest and fragility of the time with the upmost care and sensitivity, it doesn’t over power what is a gorgeous love story. For me, I always like those snippets of fact from history incorporated into stories and this is wonderfully done. The Shamrock and the Rose is such a lovely story, I thoroughly enjoyed it. I would have liked there to be more then there was, I found it a little short, but that’s to be expected from a novella. But, I would love to read more about Rose and Morgan. Over all a perfect love story for Valentines and St.Patricks Day. The Shamrock and The Rose can be purchased from Amazon. 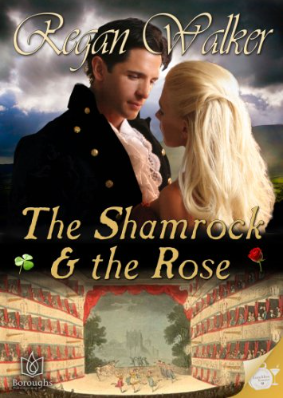 This entry was posted in Historical Romance, Novella, Reviews and tagged Historical Romance, Regan Walker, Review, St Patricks Day Romance, The Shamrock and The Rose, Valentines Romance. What a delightful review, Frankie. And, yes, it’s my shortest novella. But I’m so glad you enjoyed it! I’m so pleased you like it, Regan! I did very much enjoy it! It would be lovely to have another story which features Morgan and Rose.